Are you a hat person? The truth is that almost everyone is - it's just a matter of finding the right pattern, with the right brim, to frame your face. It's also a great way to use treasured remnants from your stash and let your imagination run wild with decorative trims. A basic hat pattern with multiple brim options will be provided at the beginning of the class. You’ll be able to choose a style that suits your own taste and the shape of your head. There’s a maximum of eight students for this workshop, so Kazue will be able to provide individual attention to each student. Join the talented Kazue Kawauchi and learn to make a bespoke hat using fabrics and trims of your choice. 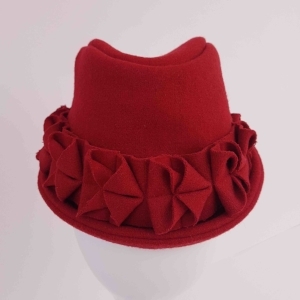 Kazue will share examples of different kinds of hat bands and then the fun really begins. Let your creativity run wild and trim your hat to create a one-off piece that will be uniquely yours. What are the best fabrics for this type of hat? Firm heavy weight wools and woven materials are ideal choices for this hat. You won’t need a great deal of fabric, so this is a perfect way to put your remnants to good use. If you need help or advice in choosing a fabric or purchasing trims, please feel free to contact us. More detailed instructions will be emailed to you upon enrolment. For more information on this course, please contact us.